WASHINGTON—Faced with shrinking tax revenues and decreased public spending, the Department of Education announced Friday the 2012-2013 academic year would need to be radically shortened from 180 days to six. 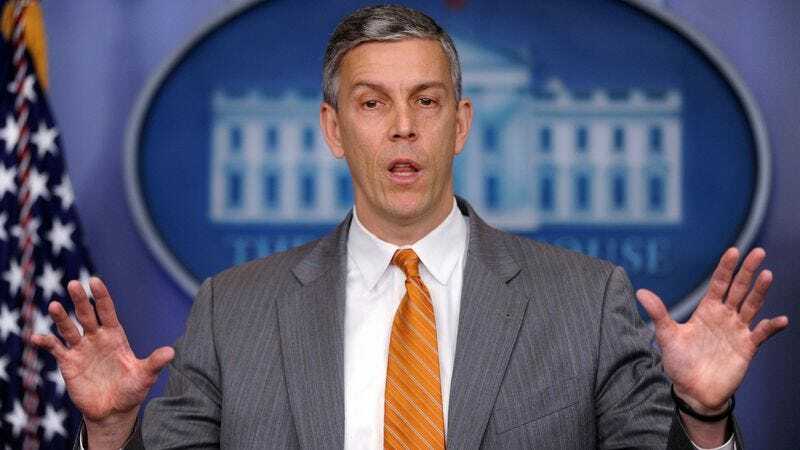 "The first day, of course, will be spent learning names, handing out textbooks, assigning lockers, and so forth, but on day two, we'll hit the ground running, covering all of history by lunch and hopefully squeezing in the entire language-arts curriculum before the final bell rings," said Education Secretary Arne Duncan, adding that any student caught misbehaving would be given three seconds of detention after class. "That will leave the rest of the week free for an intensive program of math and science designed to help American children develop the skills they would already have if they lived in just about any other industrialized nation." Duncan acknowledged not much would get done on day six, as students tend to be distracted on the last day of school, and they would in any event be worn out from the previous day's homecoming, talent show, SATs, winter semiformal, prom, finals, and commencement exercises.